Be prepared for a grinding experience that has never been there before. This specially created grinder with its four extraordinary ergonomic parts is able to grind, clean and filter at the same twist. The grinder is coated using an electrical procedure which applies a hard, toxin free layer above the surface of the grinder. 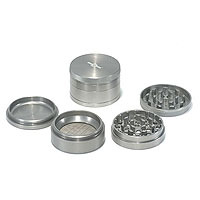 The cap grinder works in a mixnball- typical manner, the propeller formed blades and the alligator grip structure make grinding as comfortable as it gets. Little holes in the bottom part of the grinder allow the ground good to enter the main cylinder where the stainless metal screen separates and filters out the pollen. The bottom part of the cylinder can be unscrewed very easily. This highly sophisticated grinder was especially designed to fit all your needs and even a bit more, it proves once again that the mixnball grinder family offers grinding at its best. Preparation can be a pleasure. The only coated screen pollen-extractor grinder in the market.